The Wild Geese have won on just six occasions this term, but with three games to go, their fate has been sealed. However, that is not the case for Birmingham & Solihull and Guernsey. Both sides are still battling the drop and the Bees have given themselves a real chance of survival after their win against Bury St Edmunds in Round 27. The Midlands club are just four points from safety while a third victory in a row for Guernsey means they are nine points behind 13th placed Dings Crusaders. At the top, Rams RFC are on the verge of clinching the title after a professional display against Redruth. Seb Reynolds side have now secured a top two finish, but it only seems to be a matter of time before they will seal the league crown. In terms of the play-off battle, Canterbury are still in the driving seat after a hard-fought win over Old Albanian while Tonbridge Juddians managed to get the better of a spirted Worthing Raiders. Elsewhere, Clifton and Old Redcliffians both picked up victories which boosted their ambitions for the rest of the campaign. 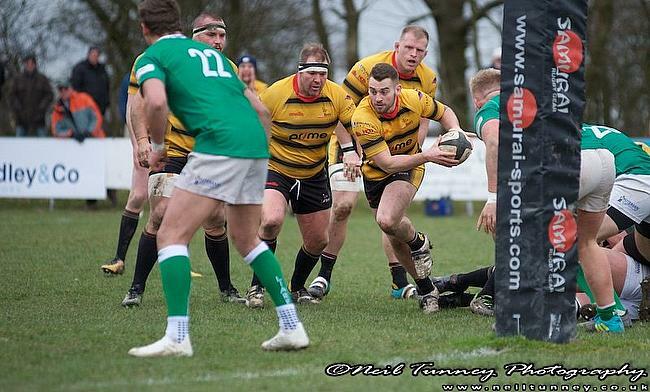 National Two South league leaders Rams RFC are potentially just one game away from winning the title after a bonus-point victory against Redruth. Scrum-half Miles Lloyd opened the scoring for Rams, who also confirmed a top two finish in Round 27, with Niall Kidd, Jamie Guttridge and Jak Rossiter also crossing. Seb Reynolds’ side require a minimum of three points from their trip to Clifton this coming Saturday to seal automatic promotion to National One. In terms of Redruth, their points came via Dean Bonds who scored twice in the second period for the Reds. Canterbury beat Old Albanian to stay in charge of the play-off spot in National Two South with only three games left in the season. The City Men took control towards the end of the first half as Ricky Mackintosh, Tristan King and Sam Kenny all touched down. Dan Watt’s try brought OAs’ back into the match, but neither side could add any more points to the scoreboard and the win for Canterbury means they are now six points clear of their nearest top two rivals. Tonbridge Juddians prevailed in a pulsating eight-try National Two South fixture against Worthing Raiders at the Slade. The hosts led 20-7 at the break thanks to scores from Ryan Jackson (2) and Finlay Coxon-Smith while Kiba Richards crossed for Worthing. The Raiders then moved ahead after tries from Matt McLean and Thomas Miller, but two penalties from Will Robinson and a try via James Stanford put TJs 31-21 up. McLean’s second score with 10 minutes remaining set-up a grandstand finish in Kent, but TJs held out for a hard-fought win to stay in touch with second-placed Canterbury. London Irish Wild Geese have been relegated from National Two South after they were thumped by Henley Hawks at Dry Leas. Wild Geese’s defeat, combined with Old Redcliffians’ win over Taunton, confirmed the visitors’ demotion to the fifth tier after a three year stay at this level. Liam O’Neil scored a brace for fourth-placed Henley while Sam Lunnon, Ian Stock, Dan Barnes, Xavier Andre, Scott Whyte and Ryan O’Neil all crossed on a rampant afternoon for the Hawks. Henley are still in the hunt for a top two finish as their bonus-point win means they are now six points behind Canterbury. Old Redcliffians took a potentially significant step towards safety in National Two South after securing an excellent victory over Taunton Titians. Old Reds were 17-7 down at the interval as Aaron Rice’s early try was cancelled out by scores from Gary Kingdom, Cory Teague and Nick Mason. However, the hosts hit back after the restart with an Ashley Groves penalty and Rice’s second followed by Ethan Doyle’s effort sealed a welcome victory for the Bristol outfit. The win for Old Reds leaves them five points clear of the drop zone as the relegation battle continues to heat up with three games to go. Clifton have moved up to sixth place in National Two South after a hard-fought victory against Barnes. The visitors found themselves 10-0 down as Robbie Martey darted over, but they bounced back as tries from Will Pomphrey and Alex Lambert put them in front. Tom O’Toole scored an excellent solo try to give Barnes the advantage again, but Lambert’s second sealed the win for Matt Salter’s men. Birmingham and Solihull have given themselves serious belief they can avoid relegation from National Two South as Jack Jolly’s late penalty rescued a bonus-point victory against Bury St Edmunds. The visitors had been in complete control at half-time as tries from Nathan Tilsley, Jolly and Matt Dight (2) gave the Bees a 26-0 lead. However, Bury got off to the perfect start in the second half as Chris Lord touched down and a brace from Mark Kohler completely shifted the momentum in the contest. Two yellow cards shown to Birmingham & Solihull allowed Alex Grey to barge over from close range as Bury turned this game on its head. However, there was to be one final twist as Jolly landed a long-range penalty to seal a potentially massive result in their survival bid. Pete Glackin’s side are now just four points shy of safety with fixtures against Barnes, Rams and Tonbridge Juddians to come. A late Tom Teasdale try allowed Guernsey to edge home against Dings Crusaders which keeps their hopes of avoiding relegation alight. With the scores level at 22-22, Malcom Barnes’ breakaway and pass allowed Teasdale to stretch over and secure Guernsey’s third successive victory and they are now nine points of safety. Tom Ceillam scored Guernsey’s only first half try while efforts from Jake Holcombe and Tom Anderson gave Dings the lead at the break. Douglas Horrocks touched down to put the hosts back ahead, but a penalty for the Crusaders levelled things up. Guernsey were then awarded a penalty try, but Dings responded yet again as James Allen scored, however, there was to be one final twist as the Raiders won it through Teasdale.